Monday Action: People’s Voice & Transparency Rally! Yesterday, the director of the DC Environmental Network (DCEN), Chris Weiss, and myself met with Jeremiah Lowery regarding the environmental justice initiatives he is currently spearheading in the District. 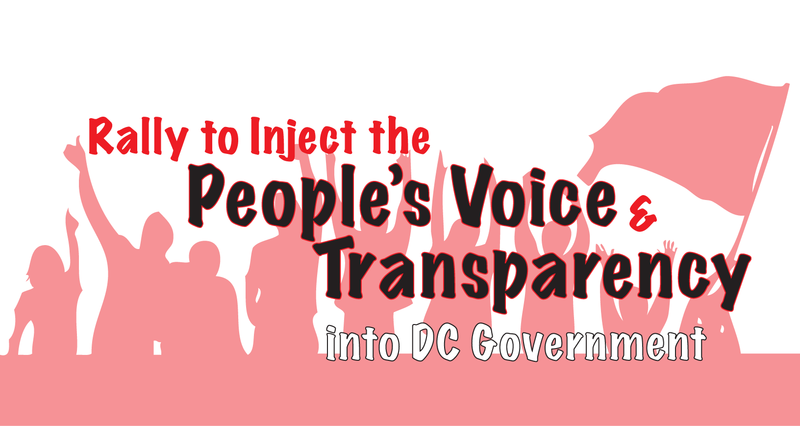 One of these is an action taking place on Monday, July 11th at Freedom Plaza from 6pm-7pm to demand increased transparency, public accessibility, and accountability from our DC Government. 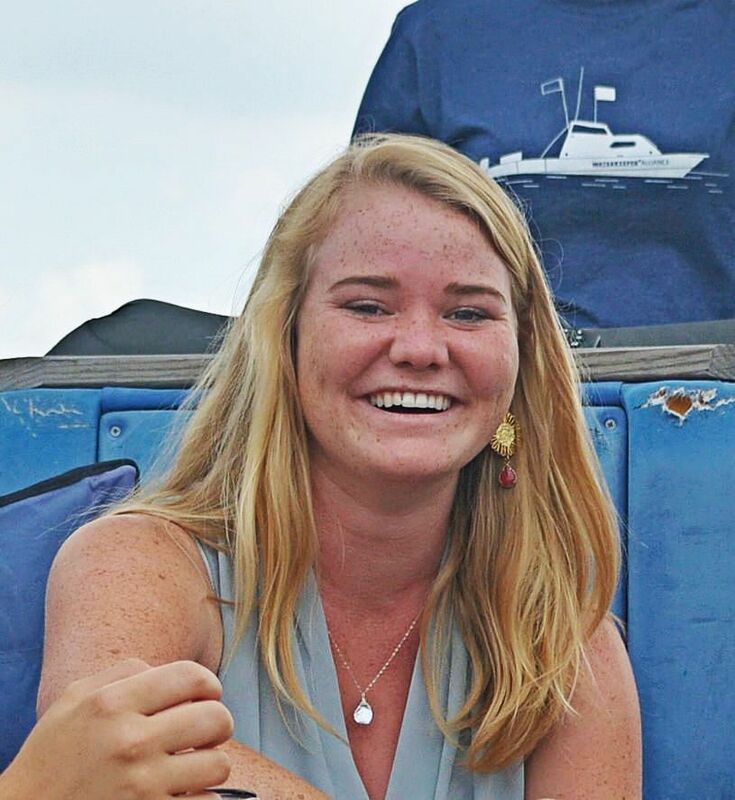 As the current environmental justice campaigner for DCEN, I believe DCEN and related organization’s participation in events such as this action are necessary. This is true for the success and progression of not only environmental but, also, social justice issues. Please find the information for the action below. Hope to you see all there! What: Have you ever been slighted or disappointed by the DC Government’s closed door process when it comes to making laws and public policy? From fast tracking the DC Constitution to no transparency in lead in school water data, to not allowing adequate and timely input into no-bid development or contract process, from refusing to give timely notice of public hearings or votes to publishing the Council budget the day before the public hearing, the DC Government suffers from a Democracy Deficit. ► Opening the government to community voices by giving timely notification of hearings, votes, and budgets, and make a regular practice of hearings in the communit-Ensuring legal, open, proper bidding processes on all contracts, with adequate oversight by the Council. ► Committing to create a new constitution through a proper and legitimate process. If you want to contribute to our list of demands Click HERE . Invite Friends on Facebook by Clicking HERE This effort is fully supported by the DC Environmental Network and we hope you can join us Monday. DCEN Report: Sierra Club Composting Facility Tour! On June 30th, I represented the DC Environmental Network at a Sierra Club sponsored tour of the Prince George’s County Western Branch Composting Facility in Upper Marlboro, MD. 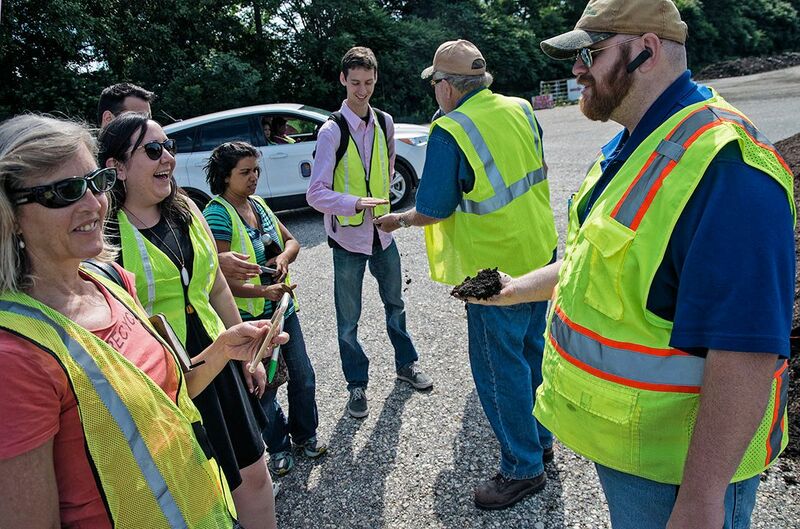 The tour, led by Steven Birchfield, Site Supervisor, explained how composting plays an important part in the circular economy. The bulk of the material composted at the facility is yard waste, primarily leaves and grass, which is placed in large windrows — long “mountains” of yard waste, food scraps, and mulch which, when mixed, compost rapidly and effectively. The facility is also the only composting center in MD to pilot the use of Gore-Tex in composting. To achieve this, a larger than usual pile of yard waste and food scraps are combined, covered by Gore-Tex (a waterproof, breathable membrane), and the oxygen and temperature levels monitored. Gore-Tex composting take only about half of the time of traditional composting and results in a final product which is significantly more nitrogen and phosphorus dense than compost produced by typical windrows. The Western Branch Composting Facility, under the management of the Maryland Environmental Service, produces and sells compost under the trade-name “Leafgro”. Leafgro is a nutrient-rich and fully-organic compost made of yard waste which otherwise would have simply gone to a landfill. By composting at Western Branch, what would have simply been waste is converted into a sustainable value-added product which contributes to a reduced environmental impact from an everyday product like yard waste and food scraps. 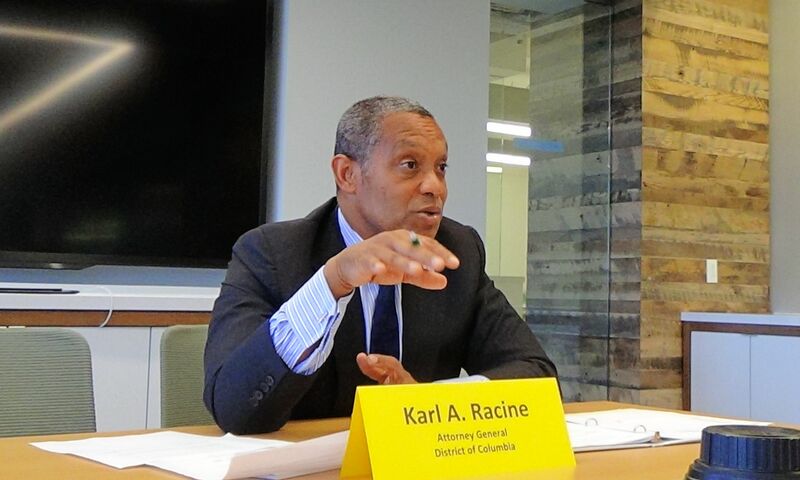 On June 8th at NOON, the DC Environmental Network, and other environmental organizations and activists, held our monthly networking opportunity featuring, Karl A. Racine, the District’s first elected Attorney General. This event was held at the NEW offices of Friends of the Earth & Green Cross International, 1101 15th Street NW, 11th Floor. You can watch his presentation here! Participants included representatives from Green Cross International, Global Green USA (DCEN), Office of the People’s Counsel, NRDC, Greenpeace, DC Water, Amalgamated Bank, EESI, Just Electric Transportation, MWCOG, ABC Birds, Earthjustice and other individuals and sustainability advocates. The purpose of the June 8th DCEN networking event was to continue this discussion, and, now that the AG’s office has had a year to get organized, work to create better structures and a stronger focus, within the AG’s office, towards protecting and defending the sustainability interests of the District. AG Racine gave an overview of some of the issues the office faced the last 12 months and committed to convening stakeholder meetings to discuss issues of common concern with the sustainability community. We hope to schedule the first Office of Attorney General stakeholder meeting sometime in August.